'The Lorax' by Dr. Seuss was adapted as an animated musical TV special within the first year after the book was written, and it first aired on my seventh birthday in February 1972. As a seven-year-old I was unaware of deforestation or industry and corporate greed, and viewed 'The Lorax' as a story, as just that, a disturbing story, but one that grown-ups would definitely never let happen! I played in the woods and ravines that defined the edges of my world, a place of imagination and adventurous independence. I now feel a pang of loss as I drive by the woods on the way to my parents’ home. I’d heard that this area was protected by the original owners of the land, but now houses and paved roads have been built into it. I'd like to stop and walk back into the remnants of those woods and show my daughter the place that was most special to me as a child. But I don't go, because the sense of place is lost, and by not seeing it up close I can dream it's still there. While we design gardens and plan for an environmentally sound and greener urban environment perhaps those of us with the expertise on tree species should step up to inform, educate, and inspire smart planting. Saving what we have is a tough row to hoe, and although I'm not giving up on preservation, there may be greater opportunity in the specifying and planting of new trees that will mature beautifully and avoid becoming targets for chainsaws. In my view trees are what make a garden, no other living element has the ability to transform scale, play with the quality of light and create a sense of permanence. Trees are for climbing and building tree houses, and for marking the passing of seasons with green tinted light, leaf raking, dripping branches and snowy outlines. 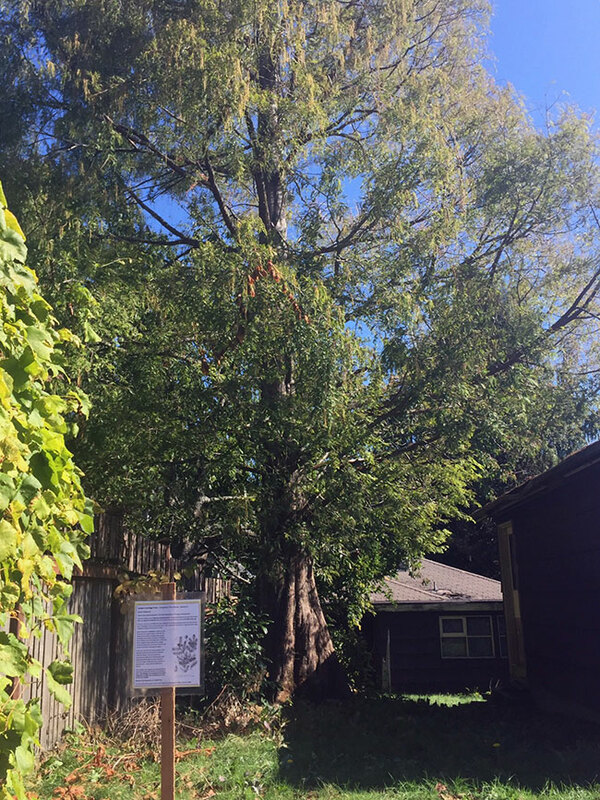 Recently I took it upon myself to preserve those special qualities in a small way by nominating a tree in my neighbor Marians’ garden for Heritage tree status within a program founded by Plant Amnesty and haphazardly administered by the City of Seattle. Marian wasn't able to speak for her trees, she had developed Alzheimer’s and been moved out of her home. 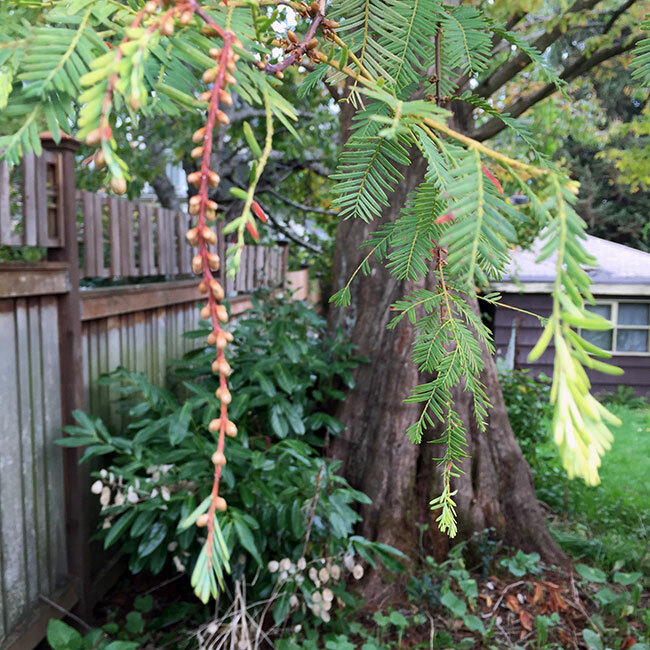 I wish I had asked Marian how she acquired this seedling as it must have been one of the first planted in Seattle after being found growing in a valley in China in the 1940’s, a tree previously thought to be extinct. 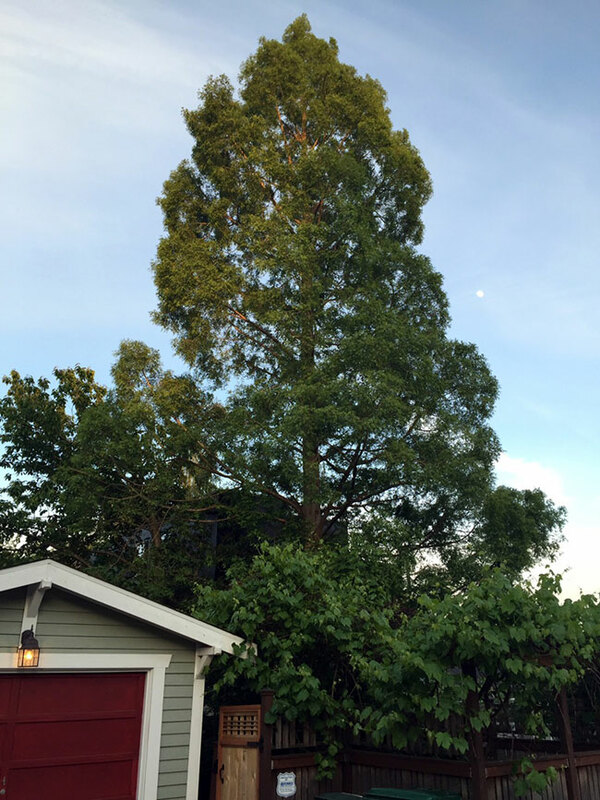 Her Metasequoia glyptostroboides, Dawn Redwood measures 28” dia. at 54" above ground, a 14 ft. circumference! At the ground it is much larger, but I can’t find where I recorded that measurement, and I can’t go onto the property to do it again. Happily, the Heritage Tree Committee evaluated this tree in May of 2015 and agreed it was indeed special. Then, less than six months later her home was put on the market. I knew this tree wouldn't be protected by city ordinance despite its status of both Heritage and Exceptional because the lot it lives on is too small to qualify (less than 5,000 SF). While looking at the tree from my kitchen window after the house sold, I decided to put in calls to the listing agent, the buyer and the buyer's drafting team to express the importance of saving this tree for Marian, for our neighborhood, and for our city. 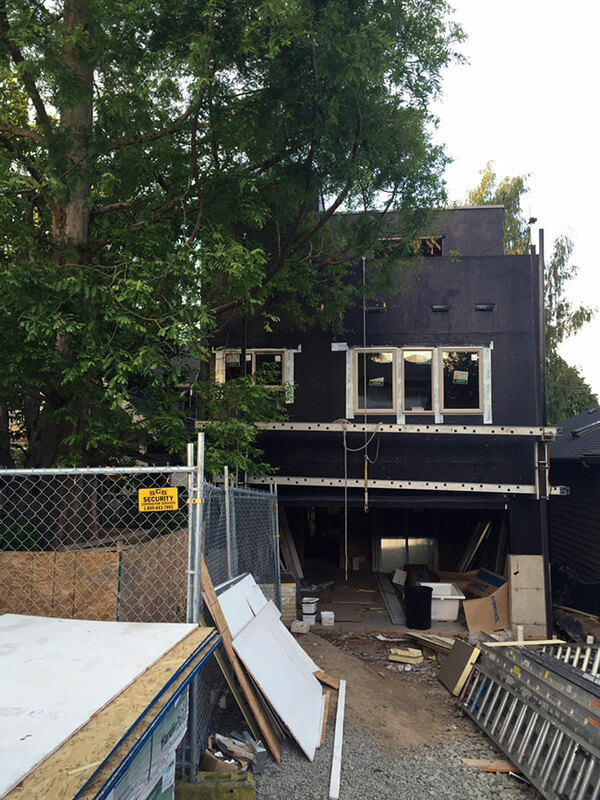 Marian's house was bulldozed in December after being sold to a developer. But her tree still stands. There have been many challenges involving the City, and there are surely more to come while construction continues without proper tree protection, a questionable lot line survey resulting in a possible maximum height violation and other unpleasant symptoms of our current building boom, but I am hopeful that this tree will be strong and survive its violations. Demolition and Construction, root zone protection? City of Seattle says there is no violation. Builder adds chain link fence 5 months into construction, City says it now complies with root zone protection…how will cars get into the two car garage? 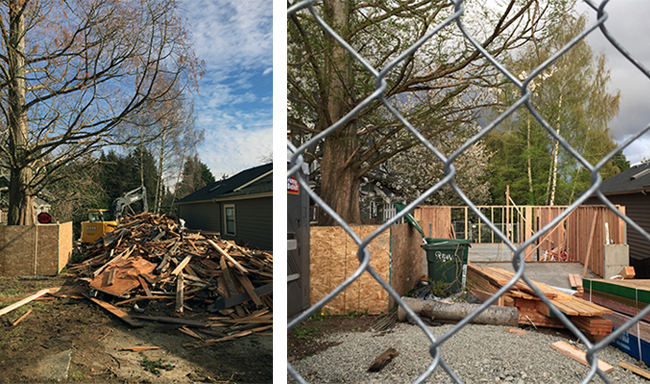 By the time this newsletter is issued I will have attended the 8th Annual Urban Forest Symposium, 'Sustaining the Urban Forest During Densification' at the UW Botanic Gardens Center for Urban Horticulture. I hope to see other APLDWA Members there. I'm looking forward to gaining insights that will help me to speak more succinctly with the City and more clearly for the trees.